Garden pea (Pisum sativum) was prominent in early studies investigating the genetic control of flowering and the role of mobile flowering signals. In view of recent evidence that genes in the FLOWERING LOCUS T (FT) family play an important role in generating mobile flowering signals, we isolated the FT gene family in pea and examined the regulation and function of its members. Comparison with Medicago truncatula and soybean (Glycine max) provides evidence of three ancient subclades (FTa, FTb, and FTc) likely to be common to most crop and model legumes. Pea FT genes show distinctly different expression patterns with respect to developmental timing, tissue specificity, and response to photoperiod and differ in their activity in transgenic Arabidopsis thaliana, suggesting they may have different functions. 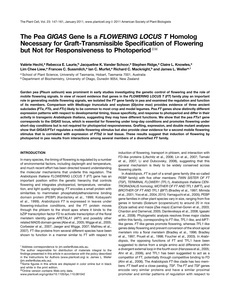 We show that the pea FTa1 gene corresponds to the GIGAS locus, which is essential for flowering under long-day conditions and promotes flowering under short-day conditions but is not required for photoperiod responsiveness. Grafting, expression, and double mutant analyses show that GIGAS/FTa1 regulates a mobile flowering stimulus but also provide clear evidence for a second mobile flowering stimulus that is correlated with expression of FTb2 in leaf tissue. These results suggest that induction of flowering by photoperiod in pea results from interactions among several members of a diversified FT family.